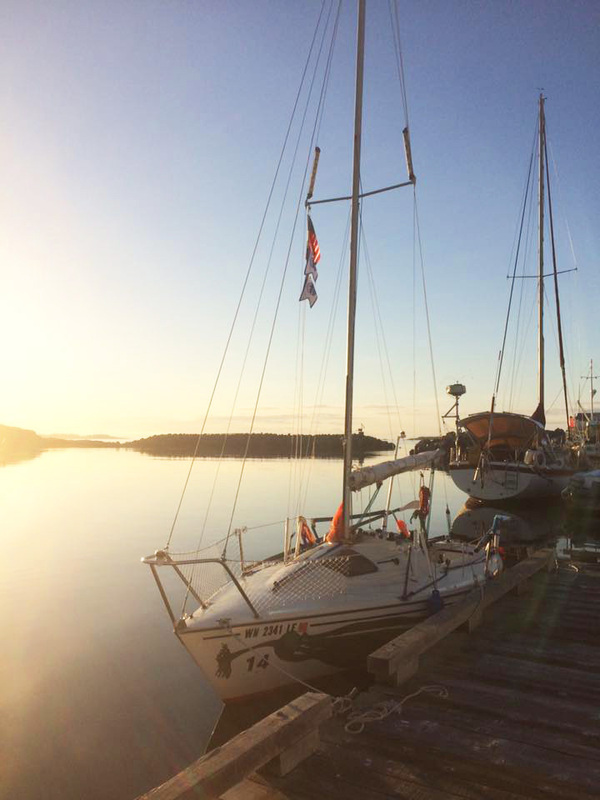 What a lot went down in the 36 hours since the start of Race to Alaska. 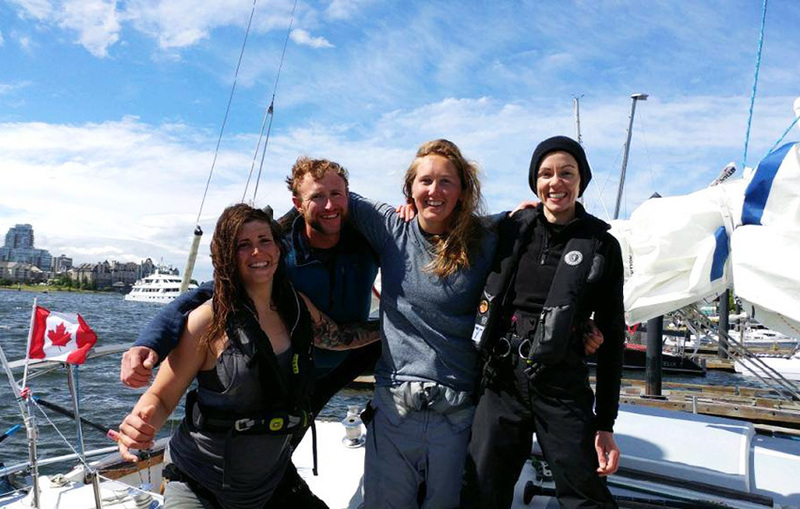 That’s the time limit for the leg known as the “Proving Ground” that brings sailors from Port Townsend across to Victoria – 36 hours. Flat calm, rain, sun, fog, haze, day, night, and, most poignantly, a monster Juan de Fuca gale smack dab in the middle. Fast human power, some slow progress under sail (thanks to both light wind and heavy air), and several scary and necessary rescues made for a most memorable first leg. A lot went down, but thankfully no boats and, infinitely more important, no sailors. I admit to have pondered the thought, ‘will the phenomenal enthusiasm for R2Ak wane eventually?’ The last 36 hours have shown me why I see no end to the drama in sight; why I refreshed the tracker more times than I can count; why a young couple I didn’t know were watching R2AK videos on their phone at the table next to me in a landlocked watering hole last night. We’re a sailing publication, but let me first note my genuine glee that human power bested sail on Thursday. 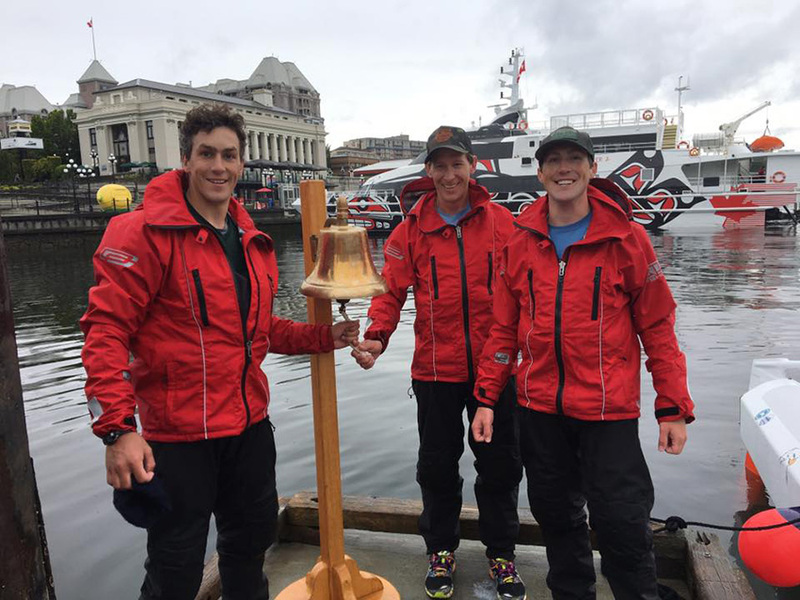 Congratulations to Team Liteboat, Team Take me to the Volcano, and Team Angus Rowboats for rounding out the podium of leg one! For any R2AK fan, the possibility that rowing, paddling, or pedaling might compete evenly with sail has always made the race intriguing. We haven’t seen human power come particularly close until yesterday, although looking back at the Soggy Beavers run in 2015 is all the more impressive now. I love yesterday’s outcome, though it makes me disappointed that none of the top three will continue on to Ketchikan this year. However, finisher #4, Team Oaracle, is doing the full race! For the R2AK sailors, the experiences were certainly varied. Prior to departure, the Ruckus and docks had been abuzz with talk about the potential front that would come in the afternoon on Thursday, and come it most certainly did. From my vantage point on the committee boat, I watched the spinnaker-driven boats slowly slip out of sight in the early morning, wondering if and when the wind would hit as forecast. About five hours later, the Juan de Fuca westerly turned on like whoa. I’ve now had direct communication with a couple teams, so read on to hear the stories of Team Freeburd/Pure & Wild, Team KELP, and Team West Coast Wild Ones. Team Freeburd/Pure & Wild, the first sailboat to finish leg one, behind four human powered vessels. A couple of the early teams barely saw any breeze. The first sailboat to finish was the accomplished trio of brothers of Team Freeburd/Pure & Wild on their borrowed Melvin and Morelli trimaran that was sailed by a different crew in 2016, but was also last year’s Pure & Wild boat. They were closely followed by the Multi 23 Trimaran, Team Pear Shaped Racing; Port Townsend boat building guru, Russell Brown, on Team Port Townsend Watercraft; as well as other race favorites like Bad Kitty and Broderna. Most of these early arrivers missed the worst of the weather. In fact, the Burd brothers never saw breeze above 10 knots, and only saw that 8-10 knots in the last couple of miles. 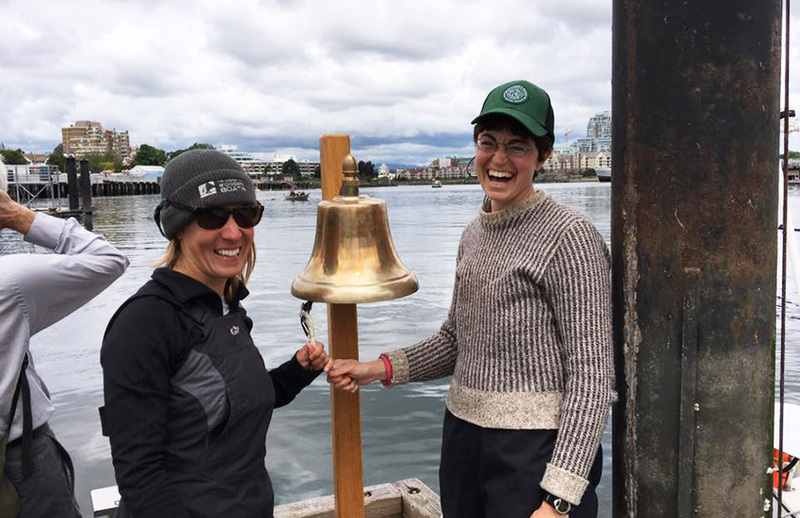 The dynamic duo of Team KELP, who are racing a Santana 20, could literally see the entrance to Victoria Harbor when the wind build so fast they had to tuck in a reef. Once they got that sorted, they were in Discovery Bay and the wind had gone to gale force. From there, it was full-on battle. After these hours of heavy air position-holding, they got an updated forecast that now had the gale continuing until 9:00pm. The decided they wouldn’t continue, and didn’t want to be making that final push in the dark after ten hours of exhausting position-holding. They turned away from the breeze and sailed down to Oak Bay, where the breeze was significantly lighter. They turned the corner for the marina, saw three other R2AK boats, and an open spot at the dock. They got so excited and relieved they nearly forgot what they were doing and narrowly missed going aground in their understandable ebullience. Their husbands had a hotel room, and they gladly took the ride into town for the opportunity to shower off the caked salt and get some real rest. All the while, though, both members of Team KELP were consumed by worry for the other teams. They had been monitoring their VHF the whole time, but given their position, they were picking up the Canadian Coast Guard calls, but couldn’t hear most of the calls or responses from the other racers. They hears the calls for person in the water and another for capsized sailing vessel. There was a helicopter. Elena said, “I had this moment when I thought, ‘someone could die out here today. '” They were right that the conditions were that severe, but thankfully all are safe. Team KELP are one of the few teams that had no equipment problems after being out in the gale. Perhaps their biggest issues were a tablet navigation issue, unrelated to the wind, and the discovery that Elena’s seven-year-old foulie pants are no longer waterproof. Each of these is a good first leg discovery, because each issue has been resolved in Victoria. A happy Team West Coast Wild Ones after beating the gale to arrive in Victoria! The race began with light rain and wind on a broad reach. We rowed with an asymmetrical spinnaker up. The current was pushing us alongmore than the sail or oars. We cut close to Point Wilson and encountered the tide rips – wet rowing! We took the SW route around the traffic separation junction, staying high and parallel to the shipping lane in the Strait of Juan de Fuca to avoid getting pulled into Discovery Bay. We rowed and progressively sailed along this course, then set ourselves up on the rhumb line. This would have set us to enter Victoria Farbour had we not been caught with our 150 genoa as the gale turned on. In a matter of 10 minutes we made two sail changes and two reefs. Beating to windward 75 degrees off the gale force winds in approximately three meter seas and an adverse current, we made minimal headway. Eventually a long tack heading into the current and putting distance between us and the lee shore set us up to just clear the breakwater into Victoria Harbour. We dropped the main and continued under a #4 jib, past the “no sail” zone, knowing we had more control under sail in these conditions. Once the police boat flagged us down, we continued under bare poles at 4 knots and used out oars to slow us, having the dock crew catch out stern line and bring us to an abrupt stop. We were the first to come in under gale conditions, third of the monohulls. We are very proud of our 1972 O’Day 27 cruiser! There are many more stories from this leg, including those of teams that had more trouble. As we hear from them, please check back with for more details at www.48north.com.